The win dashed Netflix Inc.’s hopes that its Alfonso Cuaron-directed Roma would garner the streaming giant’s first top Oscar. Los Angeles: Green Book, the Universal Pictures’ film about race relations in the US South in the early 1960s, was crowned best picture of 2018, an upset win that dashed Netflix Inc.’s hopes that Roma would garner the streaming giant’s first top Oscar. Alfonso Cuaron won the Academy Award for directing the Netflix picture, his Spanish-language look at family and class in Mexico. The movie won three awards in all, giving the streaming company some bragging rights, even if not for best picture, after a costly Oscar campaign for the film. The awards were held Sunday at the Dolby Theatre in Los Angeles and carried on ABC. With Green Book winning, theater owners will breathe a sigh of relief. Netflix has posed an almost existential threat to movie houses with widely seen film hits such as the thriller Bird Box and an artistic gem like Roma. Cinema chains like AMC Entertainment Holdings Inc. fought the online studio by refusing to show pictures it backed. With Green Book and Bohemian Rhapsody taking many top prizes, Fox and Universal dominated the awards. Green Book tells the story of a racist New Yorker, Tony Vallelonga, who is hired to drive African-American pianist Don Shirley through a tour of the South. The film was criticized as inaccurate by members of Shirley’s family. Vallelonga’s son, Nick, said later in interviews backstage that he related the story as Shirley wanted it told. 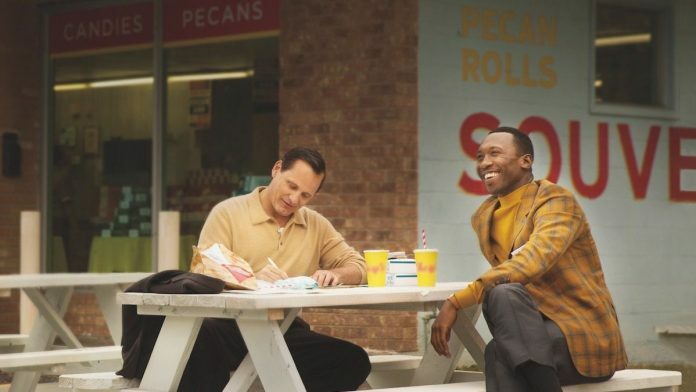 In all, Green Book grabbed three Oscars, including a best-supporting-actor award for Mahershala Ali, who played Dr. Shirley, and best original screenplay for co-writers Vallelonga, Brian Hayes Currie and Peter Farrelly. Most of the eight best-picture nominees touched on social issues like race, class and sexual orientation, which may help the show’s TV ratings after years of decline. Cuaron used his directing win with Roma to speak up for rights of indigenous women and domestic workers, who he said had traditionally been “relegated to the background” as characters in moves. Olivia Colman won the best-actress award for her portrayal of Queen Anne in the Fox Searchlight film The Favourite, a drama in which two female lovers vie for her favour. Rami Malek grabbed the best-actor Oscar for his portrayal of rocker Freddie Mercury in Bohemian Rhapsody. The film follows his rise with the band Queen, his homosexuality and his AIDs diagnosis. Spike Lee shared a writing Oscar, his first Academy Award ever, for BlacKkKlansman, about an African-American police detective who infiltrates the klan with the help of a fellow policeman who is Jewish. Lee thanked April Reign, the founder of the #OscarsSoWhite, and Cheryl Boone Isaacs, the former head of the motion picture academy, who he credited for opening up the organization to new members. “I wouldn’t be here tonight” without them, he said. Many of the early awards went to African-Americans, showing Hollywood is getting the message after excluding minority groups from key roles and jobs for years. The winners included best-supporting actress for Regina King, for her role in If Beale Street Could Talk, Ali for his portrayal of Shirley in Green Book, and costume and production-design Oscars for Black Panther. “Thank you for honouring African royalty and the empowered way women can look and lead onscreen,” Ruth Carter, who won for costume design, said from the stage. King’s award was for her role as an African-American mother working tirelessly to free her innocent son from prison. The film is the first English-language adaptation of a James Baldwin work for the big screen. “To be standing here, representing one of the greatest artists of our time, James Baldwin, is a little surreal,” King said from the podium. Bohemian Rhapsody was the big winner with four Oscars, with awards for Malek as Mercury, sound editing, sound mixing and film editing. Black Panther, the superhero megahit from Walt Disney’s Marvel division, grabbed three — for music, costumes and set design. 21st Century Fox Inc. led among the studios with six awards overall. Much of the company will soon be part of Disney, which is buying its entertainment assets for $71 billion in cash and stock.